For more than 25 years, Jeanette Paras has been creating giant celebrity pumpkins in the studio (aka ‘garage’) of her Dublin, Ohio home. It is a labor of love, a passion and a Halloween tradition … that has become an international phenomenon. Take a look at the pumpkinizing process in this time-lapse video of Jeanette painting PumpYEkin. Seven hours of work encapsulated in 80 seconds. Here is the first-ever “behind the scenes” look at how the ‘pumpkinizing’ is done in Jeanette’s studio. PumpKim Jong Un and the Annoyed Minion come to life in this time-lapse video. 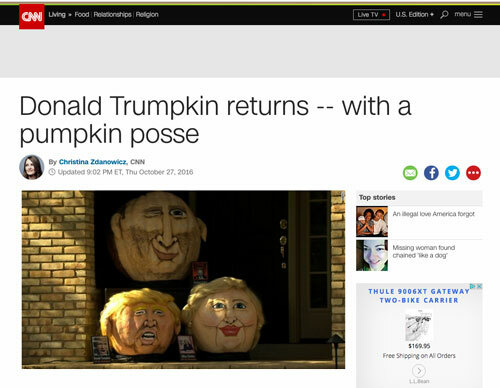 In 2016, Donald Trumpkin returned and this time, he brought friends. Hillary Clintkin and Vladimir Putkin are here with the Trumpkin to remind you that every vote counts.